Christmas, it’s a time for giving. If you’re feeling generous and are in the market for a little bit of festive shopping then we have got a humdinger of a present portfolio for you. So fasten your seat belts and let the goods unveil themselves before your eyes. Made from the real deal black cotton twill, our generously-sized aprons feature our FCFK Hackney logo in hot pink in the bottom right corner (not too in-your-face but you’d still stand out in a crowd of Mary Berry wannabes). And if that wasn’t enough, the polka dot pocket, neck band and waist tie are sure to have you swooning. These ain’t no mass-produced pinnies, we’ll have you know. Each one was made lovingly by hand (by a member of our FCFK Hackney committee no less) and with a batch of just 20 in existence, they truly are limited edition. If you’re serious about keeping the icing sugar off your clothes, but always need to be a cut above the rest, then this is the apron for you. A snip at just £15. Thank you to baker Shelly for modeling our apron and for being an all-round good sport! A bargainous bargain at a measly £5. Email us at hello@freecakesforkidshackney.co.uk if you would like to purchase either an apron or tote bag. 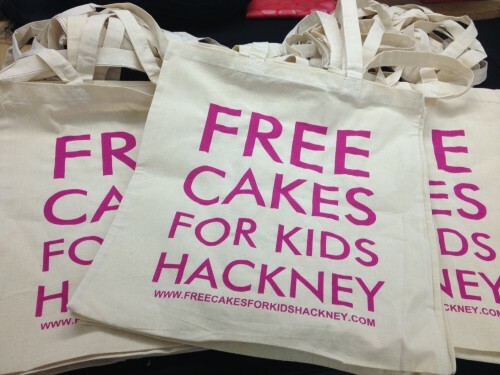 All profits made from both products go back into extending the work we do at the heart of Free Cakes for Kids Hackney.